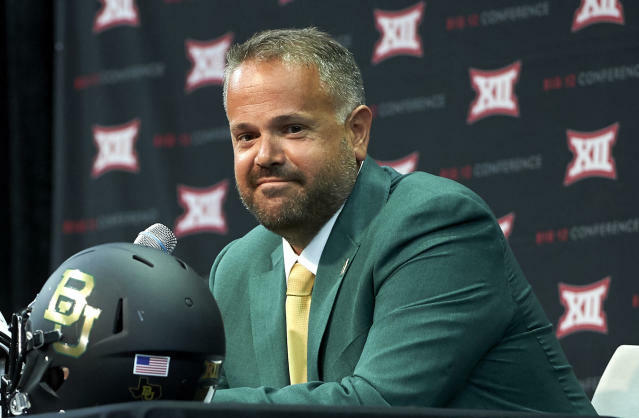 EAST HANOVER, N.J. (AP) -- At 43, Baylor coach Matt Rhule is far removed from a playing career. That doesn't mean he won't run the gauntlet with his guys to prove a point. That's the refrain from many a player, including NFL stars such as Khalil Mack, Matt Ryan, Odell Beckham Jr., and Andrew Luck — who missed an entire season because of shoulder issues. "I had a unique history after being at the New York Giants where several players wore the XTECH pads ," says Rhule, who left Temple for Baylor in 2016. "Then Muhammad Wilkerson, who played for me at Temple, was a proponent of the pads. I had a chance to see them work firsthand. When we went to Temple, we put them on several guys, and they all had positive reviews. Shoulder injuries went down. Upon coming to Baylor, we had a chance to implement the same thing. We've watched our occurrence of injuries and postseason surgeries come down subsequently. "The pads have been shown to work at a high level, and we have had tremendous personal success with them. The vast majority of our players have enjoyed the pads and appreciated the commitment to their health and welfare. I've even had other coaches reach out to me over the years to ask about them." As for the pros — the NFL does not survey shoulder pads as it does helmets — Patriots running back James White, in the midst of the finest season of his five-year career, says: "I like that the pads are light and give me a lot of range to move my arms. But at the same time, they give me all the protection my shoulders need. I've always given thought to my shoulder pads because as a person who runs and catches the football, I feel like you should have the right pads to help you get your job done." Their Cover-2 Program works with NFL teams, current and former coaches and players to buy pads and donate them back to their high schools. Zach Ertz, Melvin Gordon and the McCourty brothers have done so, and the Giants donated equipment to the New York Police Department's football squad. The patented design features the only dual-cantilever system on the market, an adjustable three-piece body system that allows each pad to fit the player's body at the proper angle while creating a natural channel for the AC joint to sit in. On the performance side, a three-point swivel system allows for enhanced range of motion, and air flow occurs into the front and back to work in conjunction with uniforms, allowing for maximum ventilation. According to many of the players using XTech's pads, that's never been a concern. Recent company addition Brooks Barnard is the vice president of sales and left Under Armour after 12 years overseeing its high school properties to join XTECH. He was attracted by XTech's implementing "an idea that was disruptive and challenged a predictable way of thinking." If anyone needs a reliable shoulder pad, naturally it is Luck. The first overall selection in the 2012 draft and the Colts' franchise QB since then never suited up in 2017. He's back now and having a strong season despite a general dearth of talent around him. "Just a little lighter," Luck says. "Been wearing the same shoulder pads and thought I'd try a new one out. It didn't come from a place that I need something different, I need more protection. It was just some new technology that our equipment managers came to me about and it's worked well so far."